Other Food: daily devos: Let's hear it for Joseph! Though the Bible doesn’t tell us much about Jesus’ earthly father Joseph, the little it does say proves God’s wisdom in choosing that particular man for the role he played in Jesus’ life. At least three times an angel came to him in a dream to give him instructions on what to do. He never argued or demurred, just obeyed. He used common sense too. When the angel told him to return to Israel, but didn’t tell him where in Israel to go, the fact that Archelaus, the son of jealous Herod was ruling in Judea made him wary of returning there. Of course the fact God warned him about that specific thing in a dream only confirmed Joseph’s wisdom. 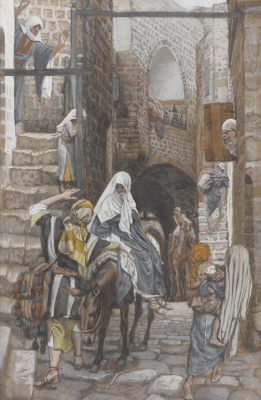 So he took his family to Nazareth, and thus helped fulfill the prophecy that the Messiah would be called a Nazarene. God knew that Jesus’ earthly father needed to be a man completely compliant to His will. He picked obedient Joseph for this important task. Am I as quick to obey as Joseph was? Are you? As you obey God’s every wish and command, He will use you in ways you had never imagined. - Oswald Chambers, My Utmost for His Highest.